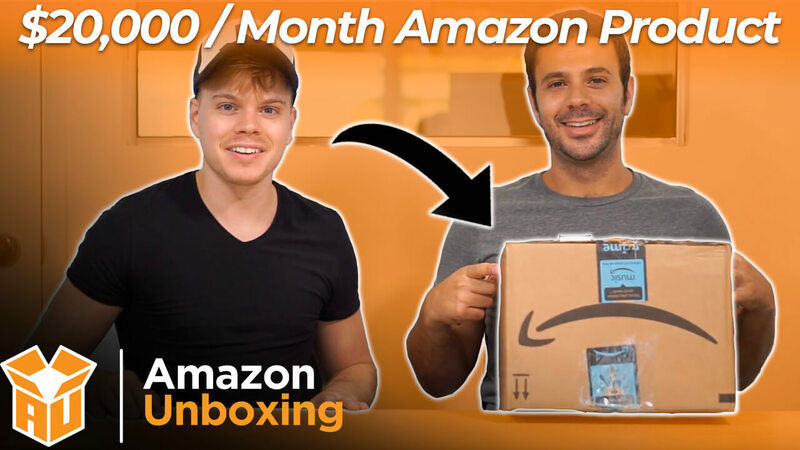 We’re at week 6 of our Amazon Unboxing Series, and we’re in for a tasty treat with this episode’s product! Joel and Adam are tearing down a listing for a waffle bowl maker. Mmmmmm…waffles. Who doesn’t love a good waffle?! 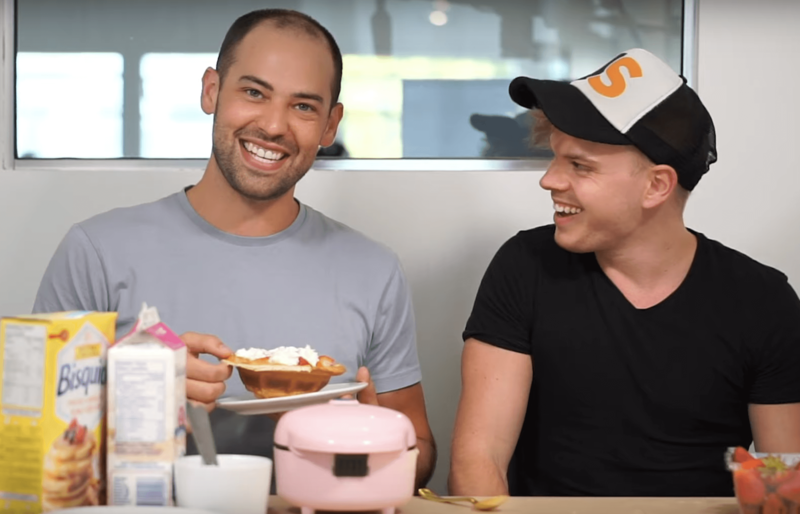 We filmed this episode back in August and, at that time, the Dash Waffle Bowl Maker was selling $20,000 per month. It had approximately 900 sales, and only 27 reviews. Now, however, this listing has 68 reviews. And sales have stayed pretty much the same. But even though this product is still selling well, by failing to optimize their listing, they’re leaving a lot of money on the table. Here’s how they can improve their product’s Amazon page, to boost their sales even more. When we first looked at this listing, it had just two images! That blew us away. 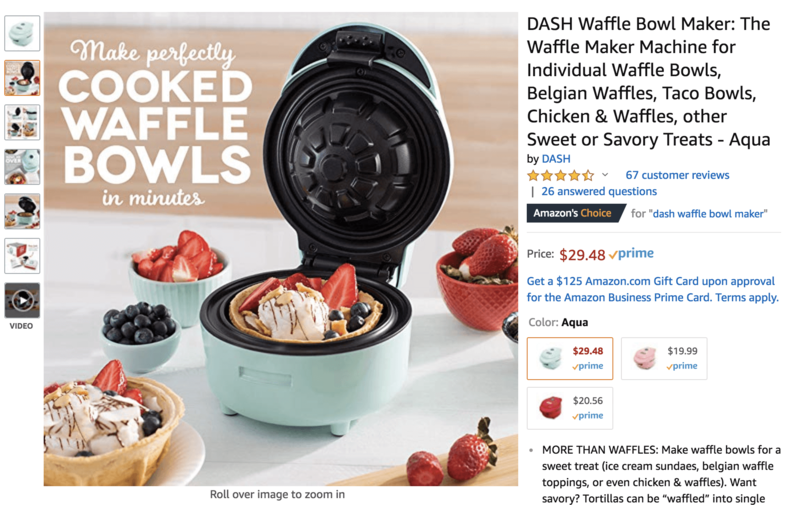 How was this waffle bowl maker selling so well, despite having so few pictures?! Considering the fact that a seller can display up to nine photos, and because images are the most important part of a listing, having just two pictures was a major, missed opportunity. And while Dash has added more images to their listing since we first checked it out, and have included infographics, it’s still missing those oh-so-important lifestyle photos. As we’ve mentioned before, people want to be able to imagine themselves using your product. 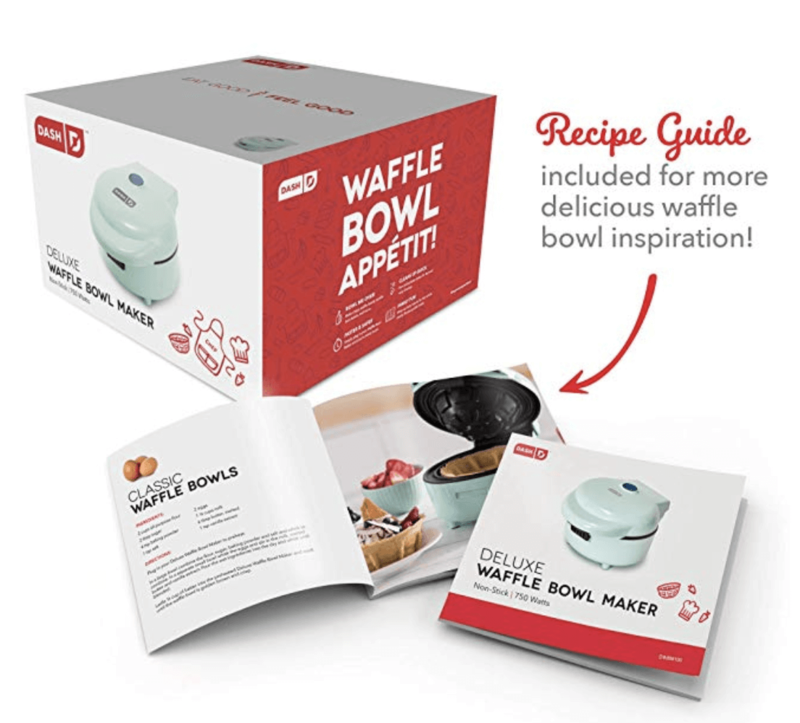 For example, a picture of parents and kids making the bowls would help potential customers visualize themselves using the waffle bowl maker. An image showing a family eating from the bowls, with the maker on the counter behind them, would work too. Again, at the time of the unboxing, there were no videos on the listing. And as a registered brand, Dash was allowed to add a video to their listing. It could have demonstrated how easy it is to make waffle bowls using their product. In case you were unaware, brands registered with Amazon have a massive advantage over unregistered brands. Amazon brand-registered sellers can add videos to their listings. Unregistered sellers cannot. And videos appear alongside the product’s photos, enhancing the listing, as video instruction tends to be easier to understand. Another perk of being a registered brand is gaining access to Enhanced Brand Content (EBC). But Dash has yet to take advantage of this feature, even though they are a part of Amazon’s Brand Registry. In addition, their product description is lackluster. It gives potential buyers little to no information about their waffle bowl maker. What they may not know is that EBC is the first thing a buyer sees when accessing Amazon via mobile technology. And something else they might not know is that approximately 80% of Amazon customers make their purchases on their phone or tablet. That makes it super important to optimize your listing for mobile with EBC. If you need help setting up your EBC, check out the freelancers on the Jungle Scout Market. You should be able to find photographers and copywriters who can create professional looking Enhanced Brand Content for you! It surprised Adam and Joel to learn that Dash didn’t use a follow-up email system. And while it has been about six months since this episode was filmed, the number of reviews for this product has only increased by 41. This number of reviews is likely due to the lack of a follow-up, asking customers to leave a review. Yet it’s a simple task. 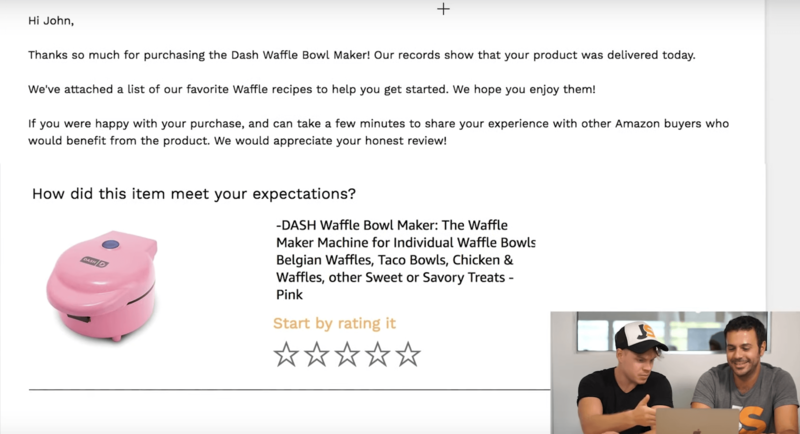 Adam created an email template for the waffle bowl maker in no time, and it included a photo of the product, along with a list of free recipes. The email also asked for a review of the product. Having an email follow-up system in place has the potential to increase your reviews exponentially, and it only takes a few minutes to set up! If you don’t have an email follow-up system set up already, head on over to Jump Send. It’s easy to get started, and the sooner you activate your email campaign, the sooner you’ll start getting those awesome reviews! Greg Mercer joined us for a waffle bowl and discussed ways he thought the product could be improved. He mentioned bundling the waffle bowl maker with a measuring cup that shows the exact amount of waffle batter needed to make the perfect waffle bowl. Genius! Bundling products can really make your listing stand out. You’re immediately adding value to your customers’ purchase by doing so. Weaving relevant keywords throughout a listing is paramount to a product’s success. 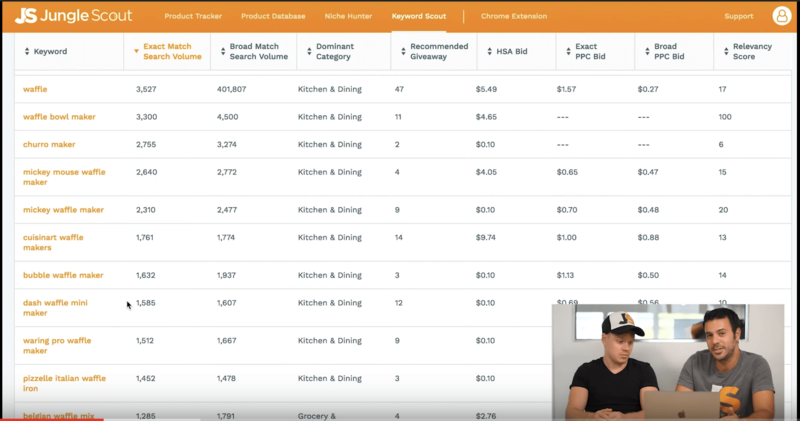 Your listing needs those keywords so that your product can rank. Do your listings have the best keywords? If you’re unsure, check out Keyword Scout. It’s included with a Jungle Scout web app subscription, regardless of subscription level. A huge bonus of registering your brand with Amazon is the ability to create an Amazon store. Dash did an amazing job with their Amazon store, showcasing their product catalog extremely well. You’ve likely seen an Amazon Store. They’re like a mini website; a platform within Amazon’s platform, where brands can display their products all in one place. And if you use Headline Ads along with your Amazon store, you can send potential customers to your storefront when they click on your ad. That means those shoppers will see your products and your products only. Needless to say, when a shopper only sees your listings, it increases the probability that they will purchase one of your products. This company definitely nailed it with the packaging. Joel was extremely impressed with the quality of the materials used, as well as the design of the insert pouch that contained the recipes included with the purchase. Dash was able to create the feeling that this waffle maker is a high end product, simply because their packaging was so well done. Quality packaging can elevate a product in a buyer’s eyes, particularly when it includes instructions and other extras customers love. In other words, packaging is another opportunity to win your customers over. If you need help with packaging design, I recommend looking at the freelance designers listed on the Jungle Scout Market. You could find the perfect graphic designer to create your eye-catching packaging! Yet again, a listing passed our unboxing test. That’s three weeks running! And even though there are still improvements to be made, this seller has done a lot right. From using the most relevant keywords, to creating awesome packaging, and building an Amazon store to showcase their products, Dash nailed it. The biggest lesson of this series, though, is don’t leave money on the table! So ask yourself: do your products measure up? Not sure? Put your listings to the test. Optimize your products and listings to maximize your sales. Go the extra mile to eave your competitors in the dust!